Cooking dinner is the bane of my existence. I have a somewhat adversarial relationship with food in the first place. Food is supposed to be fuel and yet, I sound like I’m in an unhealthy dating relationship with it, as if food were an abusive boyfriend who alternately insists I eat a plate of raw carrots and celery for dinner or tells me I’m fat while we share a big bowl of barbecued potato chips or prepares me fudge frosted brownies with sprinkles on top and encourages me to lick the plate. You may know what I mean. Anyway. I try not to fry food and eat hamburgers without buns and choose salads. But . . . brownies. It’s complicated. And then I have five other people to feed every day. Here are some of the restrictions I juggle as I consider what to cook for dinner. Person two: Likes pasta of any kind but not a lot of meat. Eats some vegetables. Not terribly picky. Used to refuse pizza and spaghetti because of the red sauces. Loves canned tuna with fervor. Person three: Drinks gallons of milk. Loves my potato salad except tonight because the pickles were “too crunchy.” Can detect the slightest difference in spices or texture and does not like change at all. If one spice is altered, refuses to eat dish. Does not like baked potatoes because they are “too much work.” No vegetables and will only eat salad if there are croutons–and not just any croutons, but the “right” croutons and ranch dressing. Does not like fruit or sweets. Person four: Just became a vegetarian. Will eat vegetables and any baked good. Likes coffee. Usually eats dessert first. Will eat pasta but not casseroles or anything spicy. Hates rice. I feel like those descriptions don’t fully express the difficulties. Or maybe I’m just a wimp. Here’s an example. Something like eggs and bacon for dinner should be simple except that some like their bacon really crisp and some like it softer. Some like fried eggs over easy and some like them over hard. Some want them scrambled with lots of pepper. Some hate pepper. Personally, I want a lot of vegetables in an omelette but no one else really digs the vegetables or omelette thing. Some want the egg cooked in a circle cut out of bread (“egg toast”). To toast or not to toast? That is the question. I spend an hour cooking eggs in various styles and burning my hand on bacon grease. They are a diverse bunch and they will not eat celery with peanut butter or yogurt with granola or a giant chef’s salad. So if I want those things, first I make things they will eat because God forbid they eat raw vegetables or whole grains. Oh sure. I should insist that this crew learn to cook dinner and take turns. I should have put the food before them and insisted that they eat it. I should have introduced spinach before apple juice and I should have always offered slivered raw carrots and celery with hummus at every meal. So each afternoon, I wonder what I should make for dinner when all I really want to do is go for a walk, eat a big salad and read a novel. And I don’t actually want help in the kitchen because I prefer to work alone–and stop trying to solve my problems or point out my inconsistencies because I just want to complain, is that a crime? If so, please lock me up because then, I will not have to cook dinner. To answer your inevitable question . . . I have no idea what’s for dinner. Isn’t it enough that I came up with dinner yesterday? ← Who says you don’t use math after high school? Wow. It’s like you’re at my house right now except with a few fewer particular bodies. We only have two kids, but between each of them they can’t agree on anything they both like and then there’s my husband who claims he’s not picky but then starts to list the foods that he “cannot” eat such as raw tomatoes whereupon encountering one he will start to gag and run to the bathroom and he is 43! (I had to put the age in there based on your last post. Suffice it to say I am older). I am a picky eater, but I own the fact that I am, although everyone in the house appears to be pickier than me and thus, since I’m the one cooking, I never have an issue with what I have to eat. I almost always have to make something for my husband and I (that he will eat) and then two separate somethings for the kids. One will eat pasta but only with butter and parmesan. One will only eat pasta with Ragu sauce (I make my own) and then he will only eat it at Grandma’s because even if I buy the same pasta and the same Ragu pasta sauce he STILL will not eat it because it “tastes different”. My mother thinks this is funny and likes to tease me about it. I do NOT find this funny in the least. Back when the kids were little with Kraft Macaroni and Cheese (The Cheesiest) one would only eat the plain version and one would only eat the extra creamy. I grew up in a house where I had to eat whatever was made and I think it made me pickier, so I swore I wouldn’t do that to my kids. It didn’t work, anyway, because I would just cry and cry until I threw up and then I was excused from the table. I know, I know…this sounds much like my husband but at least I was only 7 at the time. All of this to say – I hear you, sister. My husband and kids have been out of town the past few days and I have been alone – eating…whatever I damn well please and at whatever damn time that I chose to eat it. And it was miraculous! Oy. My post was as long as your blog. Mea culpa. This comment made me laugh out loud, specifically this sentence: ” I know, I know…this sounds much like my husband but at least I was only 7 at the time.” Thank you for sharing my pain! From your description, I can almost figure out which person is which. You have more stamina and energy than I ever had, and I applaud you for your selflessness in the kitchen. I’m so thankful I like most everything. I am not the cook here, but I have learned not to complain (much) when I don’t like something. I know where the garbage can is, and buy my own peanut butter so I always have something to fall back on. oh my word i feel so sorry for you. i would just burn down the kitchen! I am still not over it. Mostly, we eat out, and not in the pleasant way. I still resent how my teenage children of long ago would ask me what was for dinner and then decide to eat at a friends house instead. Seriously. I hold a grudge. Every. Single. Night. 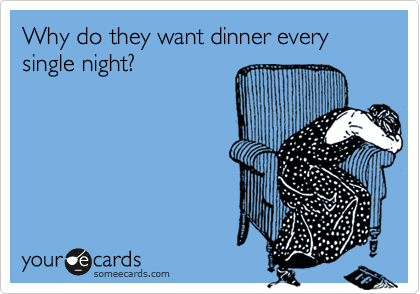 And asking me “What’s for dinner?” is the easiest way to whip me into a frenzy of frustration. I actually enjoy cooking but I hate PLANNING and SHOPPING and MAKING SURE WE HAVE EVERYTHING on the night a certain meal is planned. I don’t think I realized how fortunate I am that my kids like just about everything (some minor quibbles, like one kid won’t eat carrots in any form, and the other dislikes cilantro which the rest of us love, but compared to your list – that is nothing! ).